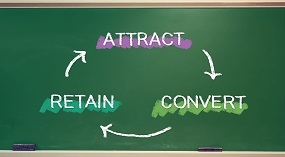 Today, I’ll cover the first stage of the insurance marketing process – Attracting new prospects. 1. Analytics: Develop a system for tracking the traffic on your website and where it comes from. If you don't already have a tool for this, install Google Analytics. It’s free and will give you a baseline and the ability to track your website track and the impact of your marketing efforts. Knowing how much traffic you’re getting, and where it’s coming from, it the first step of smart marketing. 2. SEO: Make sure your website has basic search engine optimization so that it can be found online. Sites that are optimized derive a large percentage of their traffic from organic search. This involves understanding your targeted keyword phrases, and updating your meta data and content so your site will rank in the search engines. 3. Blog: If you don’t have an insurance blog yet, now is the time to make it happen. A blog achieves so many important goals: It helps increase your site’s search engine optimization, it fuels your social media engine and it provides and interesting and constantly changing experience for site visitors. Don’t have time to write? Most insurance professionals don’t. That’s why they hire us to write their articles for them. 4. Social Media: There was a time when blogging and social media were considered fluff activities. Not anymore. If you promote your blog and other web content through social media channels, you will start getting traffic and conversions from social sources. LinkedIn is the largest source of social leads for most B2B companies active on social media networks. 5. E-Newsletter: A monthly e-newsletter works in tandem with your blog. You’re already writing at least one article a week for your blog. Now, promote those articles, increase subscribers and drive even more traffic to your website, by featuring your blog articles in your monthly e-newsletter. 6. Offline campaigns: Some offline activities continue to be essential. Plan to supplement your online efforts with some targeted direct mail. Depending on your business and its target market, you may also want to consider advertising, tradeshows, sponsorships and other activities. Here’s the thing: In the past, this was all that you did for insurance marketing. Now, it’s a supplement. The main purpose of offline campaigns is to drive more traffic to your website, where you can convert visitors into leads and then nurture them to become customers. Stay tuned for the next article in this series, which will focus on the “Convert” stage of the process.